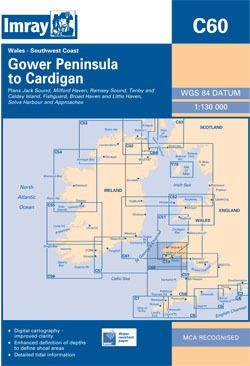 The south-west coast of Wales from the Gower peninsula to Cardigan. Scale: 1 : 127.700. One-minute gridlines. Larger scale plans of Jack Sound, Milford Haven, Ramsey Sound, Tenby and Caldy Islands, Fishguard, Solva, Broad Haven and Little Haven. Tidal stream diagrams.